If you want to grow your business, it is important to reach consumers with your advertisement or message exactly when they need to see it. This is what micro moments are all about. They are the exact moment in time where someone has an idea and decides to pull out their smartphone and conduct a mobile search. Conducting a quick search, users expect to find the information that they need quickly and for that information to be thorough enough to answer their questions or provide them with what they need. According to Google, mobile search has surpassed the number of desktop searches in the United States. Mobile conversion rates have increased by 29 percent. There has been a 20 percent increase in the share of mobile searches across the internet and, simultaneously, users are spending 18 percent less time on any given website. That means that when people conduct a mobile search, they expect to see quality information immediately. They want to make a decision in these micro moments. As a business, it is important to identify what micro moments would lead a user to search for your product or services and then prepare a mobile ad in response. 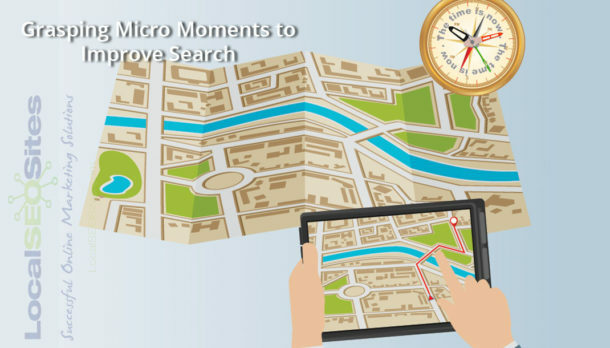 You can also optimize your website to take advantage of these micro moments. This will be different for each business, but the objective is to consider what would lead a consumer to search for something in the first place. For example, if you are a dry cleaning business, why would someone conduct a mobile search for your services? Typically, they would be looking for convenience so location would be important. They might also be in a rush, creating an opportunity for you to advertise “same-day dry cleaning in Dallas”. If you are a restaurant and trying to capture more dinner business, what would lead someone to conduct a mobile search for your restaurant? Perhaps you deliver food or offer takeout. If so, you might want to target this micro moment by advertising “fast dinner delivery in Dallas”. Micro moments happen in seconds, not minutes. It is that single second in time that someone thinks of a need, has an idea, or comes up with a question. Grabbing their smartphone to conduct a mobile search, these users need to not only find your business, but they must be able to act immediately. This is critical for successful implementation. With this in mind, your advertisements need to include “click for directions” or “click to call” and your website needs to be responsive. If someone has an immediate need, clicks on your ad, and lands on a desktop site that is hard to read or navigate, they are likely to abandon your website in search of a different solution. Given the short window of time that you have to capture this business, everything must work together seamlessly and without requiring the user to do an unnecessary work. Once you have set up your ad campaign, be sure to test it out on several smartphones to ensure that the user experience is flawless. After launching your mobile campaign, continue to brainstorm about what would lead a consumer to complete a mobile search and how you can optimize for it.